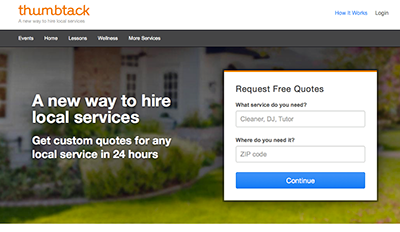 Thumbtack is a website that matches service providers with potential customers seeking that service. The customer tells Thumbtack what kind of service they need and how far away from their home companies can be located. Then, Thumbtack emails some details about the lead to a list of providers who have said they offer that service and are in the right area. Providers pay an amount depending on industry (up to $15) to respond to the lead with their information. This Businessweek article from June (now archived for paid subscribers only) explains more about the company and its history. The problem is that service providers are paying to submit their quotes or bids, and then they are at the mercy of the customer to decide whether or not to reply. Unlike with a traditional lead, where you’ve spoken with the customer by phone or interacted by email, you may not be entirely sure exactly what their needs are. And you can’t follow up easily with Thumbtack. With Visual People, for example, we can speak to a potential client and get an idea of what they’re looking for. Then we can either suggest they find a better fit for their needs and budget, or we can set up an in-person meeting, or we can decide we have enough information to send them a proposal. Over Thumbtack, though, we can’t ask those kinds of questions. While there is an option to send questions, you just can’t go back and forth easily to discern what the client needs. A lot of the time, the best we can do is submit a generic proposal. And that’s all our competitors can do, too. So, Thumbtack sort of forces customers to operate in a vacuum with no ability to gauge the authenticity of the provider. That means the decision often comes down to price, because customers don’t have a better way of differentiating. And that’s bad for local, quality-driven businesses who offer a lot in the way of service but aren’t the cheapest alternative out there. And it’s bad for consumers, who may not get the best company for their needs. Kurt Rasche, a web designer in Las Vegas, wrote a blog post detailing his experience with the service over a year and a half. Result: Lots of leads, no real clients. “I get about 2-4 emails a day with people searching for web design or graphic design, but I have yet to hear a peep from any of them,” he said in an update from this past August. More than 100 other professionals have commented on Rasche’s post with similar thoughts. As SL pointed out, it’s almost impossible to bid online without seeing the job site or speaking with the customer, seeing photos and asking professional questions. Other commenters, though, pointed out some best practices for using Thumbtack. Timing is important when responding. Successful Thumbtack users often have responded almost immediately upon receiving a lead. It’s also likely that Thumbtack users are just more likely to be shopping around or gathering preliminary info. (“I think I’ll need a new furnace soon; how much should I budget?” or “I’m interested in having a deck built in my back yard – what should it be made out of and what’ll it cost when I do get around to it?”) In this case, submitting a quote works more like advertising. You want to be top of mind when the person DOES get around to having that service done. During our experiment here at Visual People, we took the time to track down one potential customer by the information she gave, and then initiated a phone call. After discussing what she needed for her website redesign, the potential customer determined that we were out of her budget, so we didn’t submit a quote. A follow up a month later revealed that she’d decided to put the project on hold. In short, Thumbtack is an attempt to give consumers options, just like when they go to Amazon and can search by brand and size through 500 different kinds of running shoes. Where this breaks down is that services are not products. Good service providers need to interact with potential clients to get a solid idea of their needs and how to meet them. When that doesn’t happen, customers are forced to choose between company A and company B with little to go on besides price. Should your small business use Thumbtack? It’s not very expensive, and certainly worth experimenting with. Vendors who provide services for events, like weddings, seem to have more luck with the service than, say, a contractor or website designer. Our advice: Set up a profile, give it a try, but cut your losses if you find you’re not getting any valid responses.